How to make a wreath, a Christmas wreath, any wreath, for any occasion, or that special wreath that has meaning and imparts a special message. In this video, Tricia gathers greenery and makes a holiday wreath in her garden. Whether you want a Christmas wreath, a solstice wreath, or a wreath for other seasons, watch and see how easy it is to create your own unique decoration. * Choose plants that have special significance. * Use branches from your own garden. * Pick foliage and needle colors to coordinate or contrast with your house or front door. The Language of Flowers was in full bloom during the Victorian era but many of the plant meanings have ancient origins and still sound familiar in the 21st century. * Have you persisted through a challenging year? Celebrate your resilience with cedar (strength), pine (boldness), and mistletoe (I surmount all difficulties). * Is your home an especially happy one this season? Highlight that with boxwood (constancy) and holly (domestic happiness), and add some juniper (protection) to keep it that way. * To honor loved ones who are no longer with you, weave a solemn wreath of cypress (mourning) and rosemary (remembrance). * Show hope for the year ahead with blue spruce (hope in adversity) and olive (peace). English laurel is so vigorous that it can lend you branches in any month. If you have this in your garden you will have a source for wreaths to celebrate each season. If you grow holly you already know how useful that is, but don’t overlook any greenery in the garden. As Tricia says in the video, test new greenery by cutting and then leaving it for 24 hours in the environment where you will hang the wreath. If the greenery droops, don’t use it. If it stays fresh, you have another wreath ingredient. Evergreens are more than true green. Tricia mixed the blue-greens of blue spruce, eucalyptus, juniper and lavender for an unusual “blue” effect. A “white” combination she used was variegated box with the white berries and green leaves of young nandina. Go “red” with the red berries in your climate, such as strawberry tree, holly, winterberry, pyracantha, or mature nandina. Your garden offers you a range of evergreens. For even more choices, get together with friends and swap branches. Thank you to Peaceful Valley Farm & Garden Supply for this great video and instructions about wreath making. Nursery stores will carry the essential items for making your wreath if you don't have them at home already. Have you always just bought wreaths at the local store, or ordered gorgeous wreaths online? If so, then you can save the wire frame from old wreaths to make your own. Old greens can easily be taken off the frame, so it can be used again. Recycling at its best!!! Enjoy creating your own masterpiece! John from http://www.growingyourgreens.com/ goes on another field trip to visit the Orange County Great Park to learn more about what's growing on at the Great Park. The Great Park was a former military base now partially converted to a great park. After watching this video you will learn more what's growing in their raised bed gardens, see their waist height raised bed garden and learn about the hay bale garden and more. This video demonstrates many vegetables and herbs growing in various types of raised beds. Raised beds can make gardening easier because it breaks up the work into doable parts. A raised bed that is 12" or even 16" high is nice so you can sit next to it or on the edge to plant and fill with mulch etc. The mulch is a key factor to gardening because it feeds the soil and helps build a healthy environment full of microorganisms, protects from hot and cold and temperature fluctuations, and helps to retain water, yet allows for drainage of too much water. Raised beds built higher, around 3 feet high are good for those with physical limitations, and/or just a bad back. Personally, I would not have paint on the structure of my raised beds anywhere near my soil. I have built raised beds mostly using redwood and even some Douglas fir which breaks downs much faster, but yet will last for years and is cheaper than redwood. One thing that will protect the exterior of the wooden raised beds is "used" cooking oil. It really works and looks good too. I have used it on a potting bench and the shingles of a tool shed. I don't bother putting it on my raised beds because they last so long anyway. In the Sacramento CA area redwood raised beds will last for a good 20 years usually. 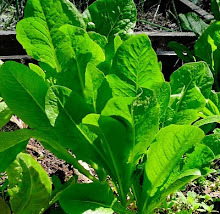 Now, there are many synthetic materials on the market for building raised beds, which may be healthy or not in contact with your soil and the food you are going to eat. Any material should be investigated before using for this purpose.